The blockchain/trust economy trend represents a remarkable power shift from large, centralized trust agents to the individual. And while its broader implications may not be fully understood for years to come, it is hardly a death knell for banks, credit agencies, and other transactional intermediaries. 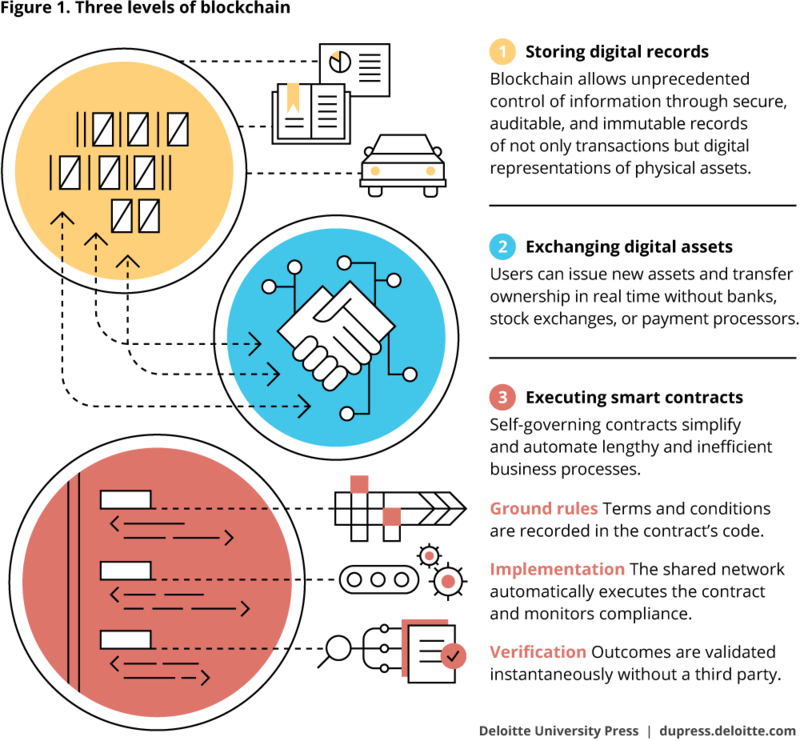 It may mean, however, that with blockchain as the gatekeeper of identity and trust, business and government will have to create new ways to engage the individual—and to add value and utility in the rapidly evolving trust economy. The system will enable participants to digitize incorporation procedures such as registering companies, tracking shares, and handling shareholder communications. For companies incorporated in Delaware, this could make registration and follow-up steps in the process faster, less expensive, and more transparent. services: Every sector in every geography should be developing a blockchain strategy, complete with immediate tactical opportunities for efficiency gains and cost savings within the organization. Strategies should include more ambitious scenarios for pushing trust zones to customers, business partners, and other third parties. Finally, sectors should envision ways blockchain could eventually be deployed to challenge core business models and industry dynamics. While it often pays to think big, with blockchain you should probably start small given that the technology’s maturity—like that of the regulations governing blockchain’s use—is still relatively low. Adriana Stan, “The future is the trust economy,” TechCrunch, April 24, 2016, techcrunch.com/2016/04/24/the-future-is-the-trust-economy/. Harriet Green, “Airbnb co-founder Nathan Blecharczyk talks Japan, business trips and blockchain,” City A.M., March 7, 2016, www.cityam.com/236040/airbnb-co-founder-nathan-blecharczyk-talks-japan-business-trips-and-blockchain-with-harriet-green. Bruce Broussard, “Blockchain: Transformational technology for health care,” LinkedIn blog post, August 8, 2016, www.linkedin.com/pulse/blockchain-transformational-technology-health-care-bruce-broussard?trk=vsrp_people_res_infl_post_title.